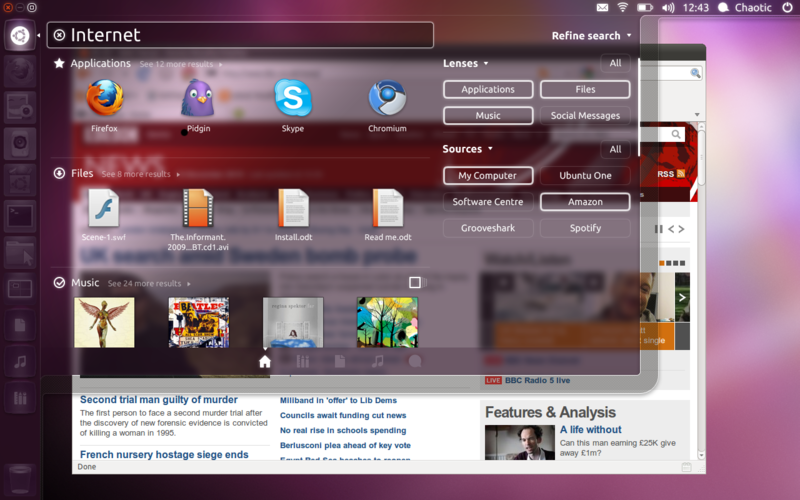 This entry was posted on Tuesday, August 16th, 2011 at 8:34 pm and is filed under design, ubuntu. You can follow any responses to this entry through the RSS 2.0 feed. Both comments and pings are currently closed. 1. The software centre looks spectacular. I haven’t tried syncing the apps across computers, but if it works as advertised, great! 2. The dash: Huge improvement. You can really tell that user testing has been performed. Small changes such as integrating the ubuntu button into the launcher, maximizing and closing in the upper left corner like in any other window… The looks are great, love the transparency, the launcher becomes colourful, the panel icons change contrast, lots of polish. The filters and lenses (?) add usability. Great, great work! 3. The global menu: I got used to it quite fast with maximized windows. Hiding the menu cleans up the GUI and lets you concentrate on work. It looks great once you know it’s there. I don’t know whether users are easily going to discover the feature. A short film or introduction during installation could help a lot. However, this is my first major complaint: Global menu with non-maximized windows is a usability nightmare!? Test it, test it, test it, you must get rid of it. I am sure the usability tests are going be unambiguous. Sorry, but copying bad apple features won’t get you anywhere. I imagine that it’s something you personally love, but think of the users (and business) first. So keep it for maximized windows and get rid of it for non-maximized windows. The menu (hidden or not) as well as the close/maximize/minimize icons must be connected to the non-maximized window the good old way. 4. Stop/system settings. You have combined the Turn-off button with the system settings. Either you integrate a separate system settings icon into the top panel or you integrate the system settings into the dash. But the current solution doesn’t make any sense. I think a slick settings lens in the dash would be the right solution. The system settings are basically programs/applications. Therefore, the dash is the place to look for them. A notification area for attached devices could be part of the top panel. I do like the new “online accounts” menu in the system settings. So far it only works for google, but it’s a neat idea. O.K. I am an experienced user, so this is the feedback of a geek. I am going to test the 11.10 on my old mom, who is still using XP. I am going to set it up specifically for her needs and test how she copes with the changes. Mr. Shuttleworth, can you please give users the option of using the “flat darkening” Dash? After using Oneiric Beta-1 and Beta-2, I am really not liking this new “colored” Dash. A setting that let’s users choose which they want to use would make everyone happy. Just because I select a wallpaper with certain colors doesn’t mean I want everything to be that color. Besides, often I’ve got a maximized window open of an application that has some totally different color. Like if I have Gedit open or a webpage, then the background color is mostly white. Opening the Dash with this background results in awful icon-contrast and results in a Dash that has zero visual appeal. One of my favorite things about the Unity interface was Natty’s Dash. I feel like this has totally been undone with Oneiric because of this Wash effect. I am really, really hoping (begging) that you will give Oneiric users a setting that will let us use the “flat darkening” background from Natty (or Unity-2D) in Oneiric’s 3D Dash. I’ve used Ubuntu since it started. I’ve stuck with it and been impressed with the fantastic achievements. I just did a new install… I’m sorry to say it, but Unity is confusing, slow and coloured like a child’s toy. The classic Gnome interface has been very effective for me, logical, simple, word based. All the gee-wizz flashy Unity colours make it look like a kiddy interface to me. I don’t think it’s a step forwards. If you must go down the gaudy colour path, please keep a simple clean Gnome-classic version for business users. Dear Mark, I’m trying Unity and I will use it because I believe in innovation and I like you idea of Linux (and 200 000 000 people that will use it). An additive icon showing the shutdown commands, connection status, chat, mail etc etc should be added. I hope I gave some interesting concepts. I’m afraid this is where you lose me as a user. I want my computer back. For ease of use, I’ll stick with my Mac. For development, some other Linux or maybe FreeBSD again. The temptation is to leap straight to criticism, but that would be unfair, because Ubuntu is not exactly alone in making changes that I dislike (Windows is going the same way), and I do appreciate many of the advances in Ubuntu that have made using a Linux desktop more viable. So, I would like to say first that I applaud the fact that Ubuntu has provided a version of GNU/Linux that, for the most part, works out of the box. Automatic detection and support of hardware was always a weakness in Linux that you have gone a long way towards solving. Similarly, I have generally positive views on the changes made to the startup and shutdown procedures. For the past several releases, Ubuntu has performed so much better than Windows on identical hardware ( where it used to be comparable, or even slightly slower ) that it is hard to believe. So, in general, I like Ubuntu, and I use it to the exclusion of other Linux distributions. But having said that, I have to admit that I am no fan of the current trends in the computer interface world. The two main drivers currently seem to be “search” based interfaces and “touch” based interfaces for small devices. Unity design seems to embody both of these trends, but at the expense of usability for normal window-centric devices. 1. Interface elements are tiny: Window borders are practically non-existent ( so they are difficult to use ), scrollbars tend to disappear whilst trying to use them unless the mouse movement is very accurate. 2. The base themes lack contrast and interest. UI elements lack much in the way of visual cues and feedback ( space saving mania again ). As a side note, it would be better that all elements of the interface match. The visuals of the 3D Unity dash are at odds with everything else. 3. Detaching the menu system from the application is plain nonsense. Just because Apple did it does NOT make it a good idea. If you want/need to save space in the application, have the menu as a drop-down from a button on the title bar. You can still merge the title bar with the bar across the top of the screen when you maximize , and it avoids having to go back and forth across the screen when a window is not maximized. 4. Floating hints ( Tool-tips ) and pop-up menus exist for some elements and not others; help features do not seem to exist directly in any Unity element, and customization appears to be close to zero ( aside from the ability to drop links into the launcher ). This means that it is hard for a user to do anything to improve usability. 5. Most of the Windows opened appear jammed into the top left of the screen, often with the launcher bar on top of it. This is not necessarily useful. Now, I understand that many of these criticisms would not apply if I were using unity on a 10″ touch screen with 1024×768 resolution. But I’m not. I have 5 devices that run Ubuntu, and none of them look like that. Conversely, I have one tablet device that does look like that, and it does not run Ubuntu, because there is no value in putting Ubuntu on it. It gets used for casual browsing, as its form factor and capabilities makes it useful for little else. I was going to now turn to the launcher and criticize its sudden loss of speed in 11.10: Initially I found that the the Dash Home took about 4 seconds to open after being clicked, and that logging out of the Unity shell seemed to hang for 10-15 seconds. Fortunately, this seems to be due to the 3D graphics driver used. After replacing the default open source driver with the ATI provided driver, everything works as snappily as I expected. Under the OSS driver the dash also looks different, maybe it was failing and falling back to 2D? The dash itself is visually attractive and functionally cool. Whilst it is aiming towards search-oriented launch, it is less so than the mess in Windows 7. I can see that for most of the time, the Dash COULD provide what I would consider a good experience. COULD but DOESN’T because, again, I can’t change anything about the presentation. Personally, I would find it most useful for the dash to present the “More/All Apps” screen ( with the filters twisty open ) directly, as I see no value at all to the dash home screen. Selecting a filter category is then akin to a selecting a sub-menu of apps in a given category, which is more familiar and useful. Searching for apps using text matching is only really useful when installing new ones, since you are unlikely to have that many in any given category actually installed. Speaking of which, I would also find it more useful to have “frequently used” and “installable” as collapsed categories, or better yet, a radio button ( as part of the filter? ) that allows selection of favorite / installed / available. If something is a favorite, you already know that, and have probably put it in the launch bar already, so it just wastes space and makes the interface look messy and confusing. Similarly, you are usually starting an infrequently used app, or looking for a new one, but not both. Putting everything in one window just isn’t helpful. When looking for documents or data, on the other hand, text matching could be much more useful given that there are potentially far more documents than applications. Categorization may well be insufficient. It may sound like that is all very negative, but it is not really. I do not have any issue with trying to introduce improvements or variants, but I doubt the wisdom of removing support for other proven options whilst the new code is still in such a raw state. Quite apart from usability issues and the lack of automatic / manual configuration, there are still significant functional bugs – for example, the categories have just disappeared from all my application selection screens, and the “search music collection” screen returns a meaningless selection when a category is selected but there is no search text. There are some good aspects to Unity, such as the lenses in dash, but overall it is inferior to Gnome 3 shell, in my opinion, and I’d rather see the devs work on other issues and just go with Gnome. One thing with Unity is the launcher on the desktop, which seems to me to be at odds with the overall design philosophy that Unity is heading toward. Why have the launcher there at all? You can hide it, of course, but then to get into dash you have to move the mouse to the edge of the screen to get the launcher to appear, and then click on the icon to go into dash. It is a pointless couple of steps when you could just mouse into the upper left like in Gnome 3 and dash open with that simple gesture. That’s one change I would certainly recommend to make Unity more attractive. Even though it is a minor feature in the grand scheme of things, it is a one reason I don’t use Unity. It just lacks some of the simple elegance of Gnome 3 shell. The icons in dash are overly large and ugly. Granted this is the case in Gnome 3 shell as well (though not quite as bad), and I had to edit a .css file to get the icons down to what looked like a professional desktop and not a cartoon one. I assume it can be changed in Unity as well, but you might consider making it more attractive by default. Those are just aesthetic issues, but I think the presence of the launcher and the extra step to get to dash are important. The feel of how it works in Unity is just clunky. If Unity were changed to eliminate the launcher from the desktop entirely (or to at least allow it be eliminated, not just hidden), and a option to open dash by simply mousing to the corner of the screen, I’d at least give Unity another look. Right now, Gnome has the more elegant solution. “Why have the launcher there at all?” Because it is supposed to provide a very quick access to your favorite applications as well as opened apps. Searching for them in the dash each and every time would be time consuming. The dash combines google like search and searching through categories and filters in a single and simple interface. I hope that third party developers are going to be able to provide individual lenses according to people’s preferences. But I feel there is one problem. You have to cover a lot of screen space with your mouse in order to accomplish you goal. Let me illustrate this. You start in the top left corner in order to open the dash. Then you wander down to the bottom in order to select the appropriate lens. Thereafter you move all the way to the right hand side in order to select a filter and finally you move back into the center of the screen in order to select the search result. Wow, after this odyssee across your wide and large screen you feel a little exhausted. Dash Filter Results Results Results.. I keep hearing how Unity supposed to be fast, but it’s a slow design. I used to be able to open a second browser in another workspace by clicking on the workspace icon at the bottom of the screen to switch to it, then clicking the browser button at the top of the screen – two clicks and I’m done. NOW I have to click on the workspace switcher button on the Launcher. Right click on the workspace where I want to open the new browser. Click on the Dash button because the browser button won’t open a second browser regardless of where you want it (took me 3 days to figure that one out). Click on Internet Apps. Click on the browser button. FIVE clicks. This is supposed to be faster? Unity reminds me of the old joke about Helen Keller’s parents punishing her by rearranging the furniture. Yes the old stuff is all there, but it’s in different places, and only the Unity team knows where and how to navigate it. The specific issue you have is a bug in Unity that will be fixed in 12.04. Apps that support launching multiple windows will do so by default if you click on them in the launcher in a workspace which does not have that app running in it. So you’ll be back to: select workspace, select app. Two more remarks about the dash if I may. The scroll bar in the dash is very difficult to use. Please add the work that you’ve been doing with scroll bars to the dash. Unity (launcher, dash, top panel + global menubar) looks modern and slick. Nautilus now looks great too. Once you’ve polished the dash a little bit more, I think Ubuntu should start giving a little more love to the default applications and their integration. Thunderbird and Firefox are great. The lo-menubar for libreoffice. Gwibber and empathy need some love. Unity would be easier if each program had it’s own tab in the taskbar. Please please please please pleeeeeease implement this. Keep everything and have every program clickable in the taskbar.